There are many reasons people get into the reef aquarium hobby. For some, it is the beauty and color of fish and corals. For others, it is the challenge of keeping a successful “piece of the reef” in their home. What inspired me to change all my freshwater aquariums into reef tanks was a desire to keep a pair of True Percula Clownfish with an anemone host. This was my goal and I eventually achieved it, although it did take some time to get there. If this is your goal as well, this article should help your dream become reality! Today I will cover the symbiotic relationship between clownfish and anemones, address myths you often read on aquarium message boards plus provide tips and tricks myself and others have used to successfully coax clownfish into using a host anemone. Before we dive any deeper (pun intended), let’s first discuss the symbiotic relationship of clownfish and sea anemones. It is pretty evident to most what clownfish get out of the relationship. First, they get a “home” within the stinging tentacles of the anemone that protect it from predators. Without this fortified home base, slow-moving clownfish are sitting ducks for larger predatory fish, like groupers and barracudas. What do anemones get in return? 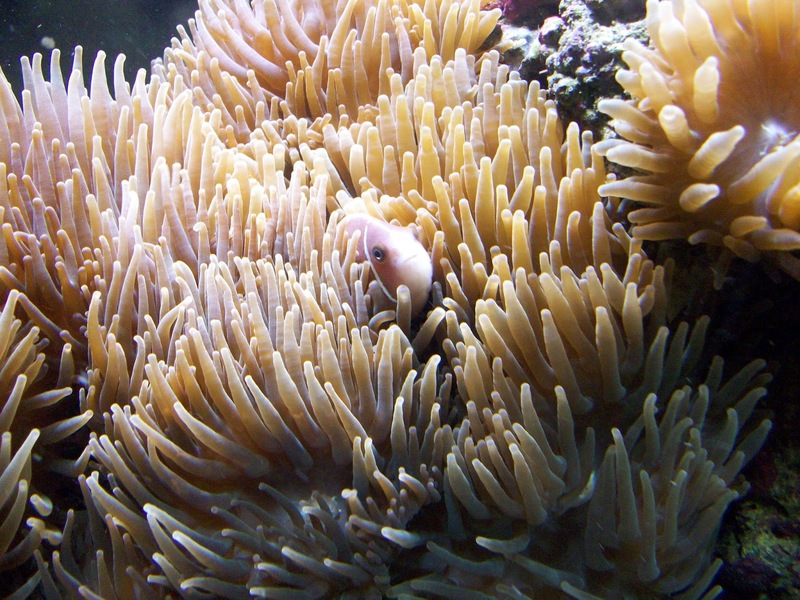 Anemones also receive protection from polyp-eating predators, such as butterflyfish and angelfish. If you keep a pair of clownfish in your aquarium, you may already be familiar with just how protective they can be. My clownfish often bite me during routine tank maintenance. When it comes unexpectedly, it can be quite a scare! 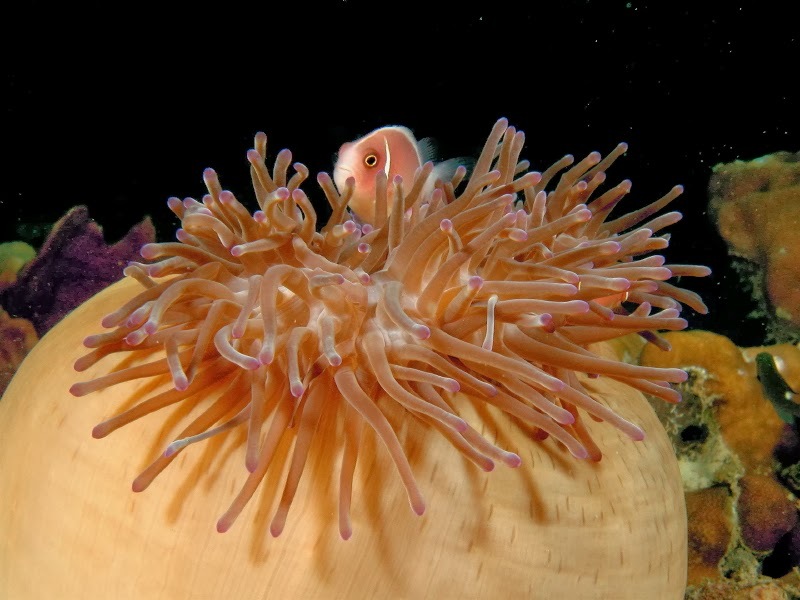 In addition to protection, anemones also receive sustenance from clownfish in the form of food scraps and feces. Now I’d like to bust a couple of myths that have been circulating for years to help thwart the spread of misinformation. I’ve heard this first myth numerous times and it simply isn’t true: “Tank-bred clownfish will not use a host anemone.” I have only kept tank-bred and raised clownfish in my reef aquariums and they all eventually adopted a host. In fact, in aquariums where I had no anemone, my clownfish would find another host to suit their needs. I have had clownfish host in open brain corals (Trachyphyllia geoffroyi), xenia, anthelia, Euphyllia (Frogspawn, Hammer), Heliofungia (which looks like an anemone anyway) and even a Derasa clam. The second pervasive myth I often encounter is: “Clownfish need an anemone to survive.” Again, this simply isn’t true. Clownfish will survive just fine without an anemone to host them. 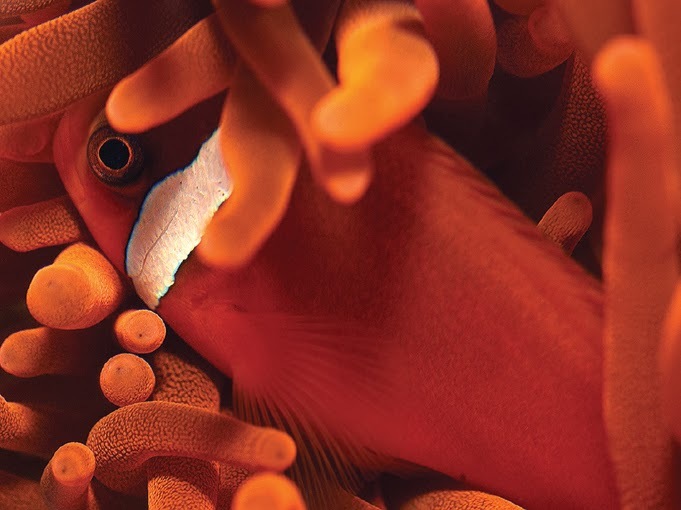 As I mentioned earlier, clownfish often find a replacement host to snuggle up to or, in the case of a fish-only aquarium, stake out an area and establish it as their home turf. With our myth-busting out of the way, it’s time to talk tips and tricks. Your objective is to ensure your clownfish and anemone are a match and that they “find” each other. The best piece of advice I can offer is to get a clownfish and anemone that would naturally pair up together in the wild. A big mistake I have seen over the years is people purchasing Condylactis anemones (sometimes referred to as Atlantic or Pink-Tip Anemones) and hoping their clowns will use them as host. While there are exceptions to every rule (even I have seen this once), these anemones rarely host clowns. I personally have found the best anemone for hobbyists to use is the Bubble-Tip Anemone (Entacmaea quadricolor). Not only are these anemones colorful, tank-propagated specimens are common (side note: purchase an anemone that is tank propagated, if at all possible). According to Anthony Calfo, 12+ clownfish species prefer BTAs. 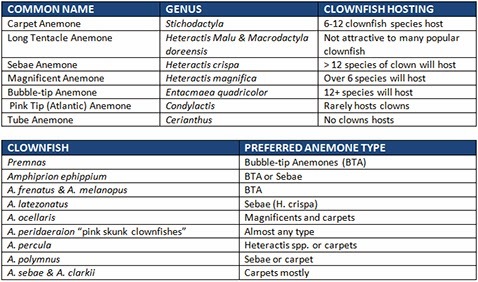 The following table from Anthony Calfo shows popular anemone hosts with compatible clownfish. What do you do if you have the right clownfish and anemone but your clown STILL won’t use the anemone as a host? This is where things get tricky. 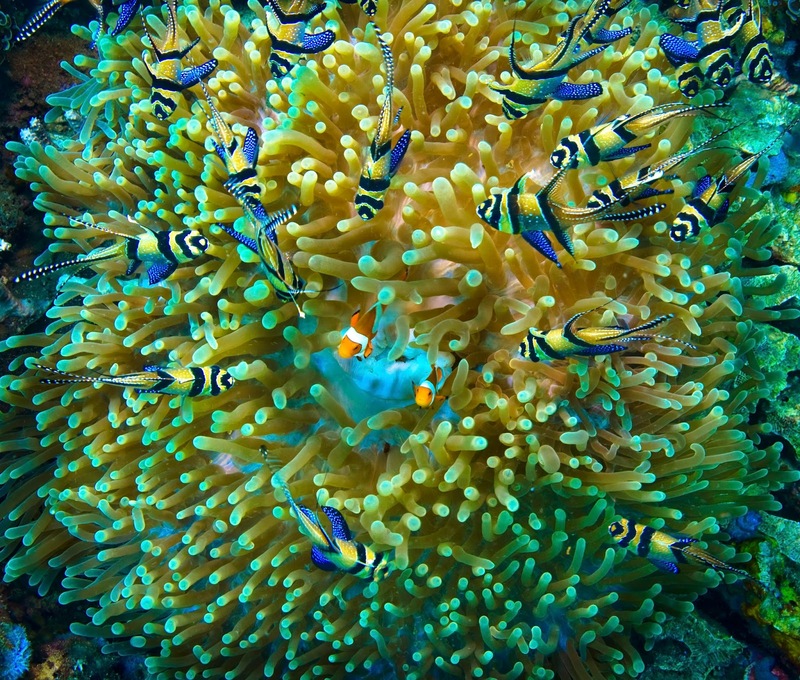 We know clownfishes use anemones for protection. So if the environment you’ve created for them feels safe, they may not have any desire for protection. Perhaps the clownfish has been living in your aquarium for years without an anemone and already has a home territory. Maybe you have an anemone perched elsewhere in your tank your clown shows no interest in. Whatever the case may be, your goal is for them to form a symbiotic relationship. However, it may require some persuasion in order for them to form a bond. The best way I have found to accomplish this is to make the clownfish in your aquarium feel less safe. You can achieve this by adding more fish (preferably larger fish if your tank can accommodate them) or rearranging the aquarium rock in your aquascape. Your newly evicted clownfish is then forced to find a new home. Another trick is to attach a mirror or a photograph of a clownfish to the outside of your aquarium. The idea behind this ruse is to give the illusion another clownfish is invading your clown’s territory. The ideal outcome is your clownfish will feel threatened enough by the intruder to dive into the waiting tentacles of the anemone. 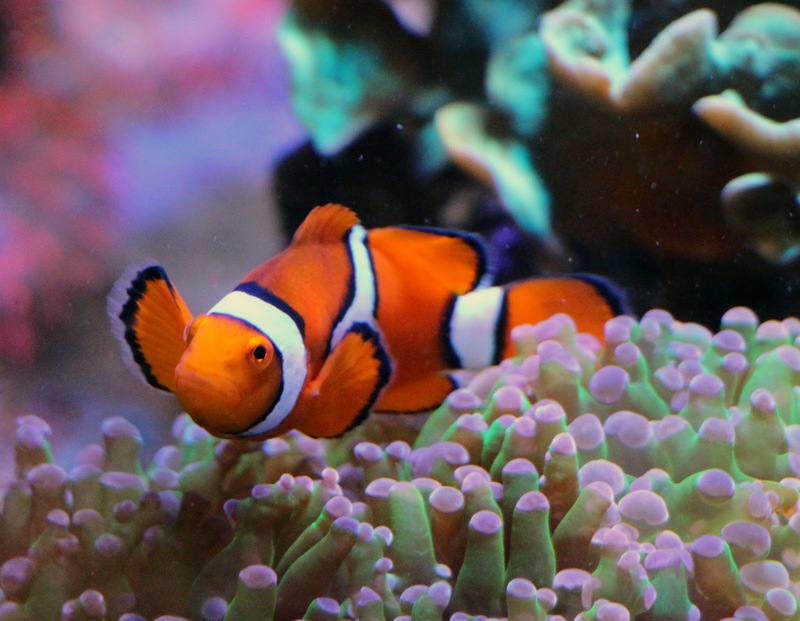 If your goal is to create a symbiotic relationship between a clownfish and anemone in your aquarium, hopefully the suggestions in this article help you get there. If your clown and anemone already get along swimmingly, we would love to hear in the comments how you made it happen to help other readers. I thoroughly enjoy watching my clowns nuzzling, nibbling and spawning in the comfort of their anemone hosts and I know you will, too!